"Unfortunately, the world's most notorious killer is still very much at large"
'Breaking the Rules 2001' and 'State of the Code' reports were released during the World Health Assembly in May to coincide with the 20th anniversary of the International Code of Marketing of Breastmilk Substitutes. The new reports, detailing Code violations by infant food manufactures, have once again found Nestlé to be responsible for more marketing malpractice than any other company. While most manufacturers' violations were fully described, Nestlé's have had to be presented in a table format because of the sheer volume of its violations. Breaking the Rules 2004 can be ordered from the Baby Milk Action Virtual Shop. Chief Executive, Peter Brabeck-Letmathé, claims to personally review any hint of a violation. Why not send him a letter? See the Campaign for Ethical Marketing action sheets for ideas. In January this year Cameroon became the 20th country to join the Nestlé boycott. Cameroon Link, a non-governmental organisation based in Douala, Cameroon, decided to launch the boycott and join the international campaign after it found Nestlé promoting its Nan and Guigoz infant formula in health centers with film shows. James Achanyi-Fontem, President of Cameroon Link, said "If every Cameroonian joins in this boycott, it may act as a powerful tool which may very quickly bring changes to the marketing in Cameroon". On its website Nestlé denies the violation report (see the April/May 2001 Campaign for Ethical Marketing action sheet for further details). The boycott has now been launched in 20 countries, in each case by a national group. Australia, Bulgaria, Cameroon, Canada, Finland, France, Germany, Ireland, Italy, Luxembourg, Mauritius, Mexico, Norway, Philippines, Spain, Sweden, Switzerland, Turkey, UK, USA. Ethics and democracy were two key issues at the Nestlé Shareholder meeting in Lausanne in April. Over 2000 shareholders were present and, in front of US TV cameras, Nestlé was on best behaviour - friendly with everyone - publicly welcoming the news on breastfeeding (See Update 29). Unlike smaller companies, where shareholders are at least able to get resolutions put on the agenda, £147.5m is needed to do this with Nestlé. Nestlé's refusal to turn up at the EU Parliamentary Hearing illustrates further its lack of respect for democratic procedures (see below). IBFAN has attended the AGM since the early 90's when non-Swiss were allowed to own shares after Nestlé bought Rowntree. At this years AGM, Patti Rundall of Baby Milk Action asked the new CEO, Peter Brabeck, a number of questions, including his views on ethics. "Ethical decisions which injure a company's ability to compete are actually immoral." "I decided to eliminate the word ethical from Nestlé because it's a word which divides people as opposed to uniting them. 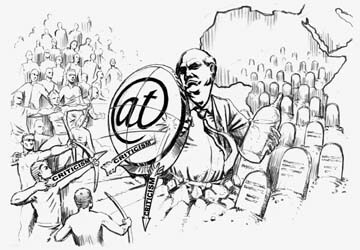 Ethics, if you look into dictionaries, are a set of moral standards within a very specific unit of society, and ethical standards in Britain, Switzerland, Chile and China vary to a large extent. And because this word is more likely to divide than to unite we don't talk about ethics at Nestlé. We talk about responsibility. Our responsibility to our shareholders, our employees, and all other stakeholders. It's true that we do have a social responsibility that corresponds to a global company as opposed to the group interests of one community or another community." Does a low-income mother count as a stakeholder or a responsiblity for Nestlé? Nestlé is worth $49 billion and its shares have a market value of US$ 2,190 (£1,470) but you need to own US$ 219.5m (£147.5m) to put an item on the agenda at its AGM. No one can use voting rights in excess of 3% of the total share capital, and anyone working with someone else is counted as one! The Resolution adopted to reduce the value of shares by a factor of 10 will give more members of the public the right to speak from the floor at the AGM - but that is all. Once again we asked Nestlé several questions - most were unanswered. Will Nestlé abide by the Code and Resolutions in all countries? Will it condemn violence to whistleblowers? Will it change all labels of complementary foods to 6 months and end promotion before 6 months? Will it end marketing in schools? Will it end Internet advertising? Will it stop exploiting HIV and distorting the risks? 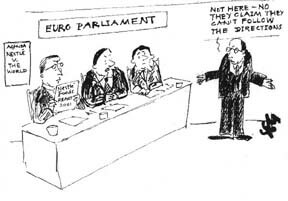 Why did it not turn up at the EU parliamentary hearing? Mr Peter Brabeck-Letmathe Chief Executive Officer, Nestlé S.A. 55, Av. Nestlé. CH-1800 Vevey, Switzerland. "I have been boycotting Nestlé for years because of its record in developing countries. Boycott Nestlé and help save babies lives". Another British actress to add her voice to the campaign is Julie Walters. She said: "It is vital that new mothers should be given the best possible advice. This should definitely include the promotion of breastfeeding as the best possible start for their babies. It is iniquitous that multinationals, of which Nestlé is a prime example, should ride roughshod over the International Code in order to increase their profits. Please join the worldwide boycott against Nestlé." Two other celebrities have become endorsers of the boycott in the past few months; Zoë Wanamaker CBE (right) and Richard E. Grant. 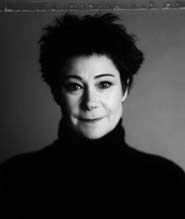 Other long-standing endorsers include Victoria Wood, Jane Asher, Tony Robinson, Germaine Greer and Gerald Scarf. Ocean Colour Scene, who earlier this year pulled out of a Nestlé promotion because of Nestlé's marketing malpractice. What do Pulp, Dodgy, Cast, Ocean Colour Scene, Shed 7 and Ian Brown have in common? They have all recently ditched Nestlé. The musicians pulled out of a Nestlé-linked promotion for the V2001 music festival or television advertisements after hearing about the boycott. As a result Jarvis Cocker had his picture in the British Medical Journal and the International Code was mentioned in the New Musical Express - both thought to be firsts! The South West Trade Unions Council passed a motion at its meeting in April to endorse and support the Nestlé boycott. The motion, put forward by Unison, was voted on and passed after the issue had been thoroughly debated. The SWTUC is the first regional TUC to become an official endorser. It is now hoped that a motion could be taken to the national level of the TUC. With an 87% majority, Students at Limerick University passed a motion at their University Union last month banning Nescafé from the Union buildings. Student campaigners raised awareness by running around the Uni pubs & restaurants in "Vote Yes T-shirts", fake breasts, and drumming & chanting "Hey! Hey! Ho! Ho! Nescafé has got to go". The ban at Limerick brings the total number of Universities and student groups in the UK and Ireland who officially endorse the Nestlé boycott to 78. Peter Blackburn chief executive, Nestlé UK admitted to The Guardian (21 April 2001): "In the student sector it is a very real issue." Contact Baby Milk Action for help in campaigning at your school, college or university. We have a draft resolution you could put to your student union or other organisation. We can help with posters and leaflets. We will also come and debate with Nestlé. Remember the 'milk round' offers an opportunity to raise Nestlé's record and the profile of the boycott. Baby Milk Action welcomes assurances recently given by the British Red Cross (BRC) that it does not "endorse the commercial activities of the Nestlé company." The BRC has also announced it is investigating claims of Nestlé baby food marketing malpractice. The announcements came after Baby Milk Action reluctantly complained to the Charity Commission about statements made by BRC staff as they defended a £250,000 deal with Nestlé supporting its Linking Lives programme. Saatchi and Saatchi advised Nestlé to go on the offensive, advertising how much it gives to charity after the damning ruling by the Advertising Standards Authority against the company's claim to market infant formula "ethically and responsibly". The BRC was among four charities to benefit from Nestlé's "philanthropic" gesture of £1 million; Kids Club Network, Shelter and Macmillan Cancer Relief were the others (see Boycott News 27). As part of the deal the BRC promotes Nescafé coffee, the principle target of the boycott. Save the Children has also sent the BRC a report on monitoring which it recently conducted in Brazil, and which found Nestlé violations. The BRC has contracted Stephen Lee from Henley Management College to investigate and Baby Milk Action arranged to meet with him. This was eventually changed to a telephone interview about governance and reputation issues. Baby Milk Action has asked the BRC Board again for a meeting and for a copy of the terms of reference for the research. A meeting with the chairman, Professor John McClure, has now been arranged. We invite anyone considering Nestlé sponsorship to contact us at the outset so we can make our case. Nestlé continues to defend its Baby World Club in Singapore despite the fact that the Code of Ethics Committee states that baby clubs are banned and companies have been told to refer mothers with questions on infant nutrition to the health care system. "Why does its club target pregnant women?" See the Campaign for Ethical Marketing for past action sheets on this issue. After years of refusing to debate the baby food issue in public with Baby Milk Action, Nestlé decided to attend a meeting with medical students at Cambridge University on 15th March, perhaps because of its inability to recruit graduates from Cambridge and other UK universities. The meeting was chaired by Professor Spencer of the Law Faculty, and we hoped the willingness to debate signalled a new openness. In the event Nestlé used its usual tactic of denial and deception and rejected a four-point plan put forward by Baby Milk Action to save infant lives and ultimately to bring the boycott to an end. Nestlé disputed the scope of the International Code and Resolutions and the countries where they apply. Both of these failings of Nestlé policy have been addressed in the past by UNICEF and by the European Parliament. Nestlé suggested that film of dying infants from India was unrealistic as poor mothers cannot afford its formula - in reality parents often over-dilute formula to make it last longer or the whole family goes without to meet the cost. The company claimed that it was unaware of specific violations, insisted that they were not important or claimed that they were in the past. Totally unacceptable practices, effectively stopped by the Code, such as sending sales reps. into hospitals dressed as nurses to promote products (so-called 'milk nurses'), were done "with the best possible intentions" according to Nestlé. Following the debate, Nestlé (UK) Chief Executive, Peter Blackburn, told The Guardian, in a full back page feature, that Nestlé had difficulty recruiting graduates in the UK. The Guardian reported (21st April 2001): "Nestlé has recently deployed an employee from Sri Lanka, with experience of Nestlé's on the ground activities, to talk to students in Cambridge." "She was just shouted at, howled at. 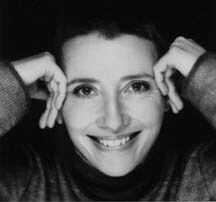 She was really shocked, in a place like Cambridge, which she'd always understood to be the pinnacle of academia, to be treated like that." This in no way reflects the debate which took place at Cambridge University - which was filmed by Baby Milk Action. 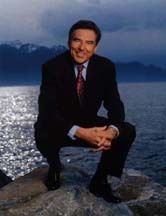 Professor Spencer commented on the well-mannered tone of the debate. Beverley Mirando and Hilary Parsons of Nestlé present company policy at the Cambridge debate chaired by Prof. Spencer with Patti Rundall and Mike Brady of Baby Milk Action. 15th March 2001. Mr. Blackburn also falsely claimed that the boycott is only active in the UK, prompting letters of correction from boycott groups around the world. 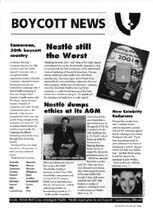 See the February/March 2001 Campaign for Ethical Marketing action sheet for details of how to write to Nestlé to ask it to accept the four-point plan. 1. Nestlé must state in writing that it accepts that the International Code and the subsequent, relevant World Health Assembly Resolutions are minimum requirements for every country. Nestlé does not accept that the Code applies to all countries, only those on a list of its own invention and even then, Nestlé follows its own weaker Charter rather than the Code. Nestlé refuses to recognise that the subsequent Resolutions have equal status to the Code. 2. Nestlé must state in writing that it will make the required changes to bring its baby food marketing policy and practice into line with the International Code and Resolutions (i.e. end its strategy of denial and deception). Nestlé continues to dispute any wrong-doing even in the face of documentary evidence of malpractice, fines, convictions and rulings against it. 3. Baby Milk Action will take the statements to the International Nestlé Boycott Committee and suggest that representatives meet with Nestlé to discuss its timetable for making the required changes. Nestlé has not provided the necessary statements. 4. If IBFAN monitoring finds no Nestlé violations for 18 months, the boycott will be called off. Nestlé continues to violate the Code and Resolutions in a systematic manner. Nestlé's marketing of breastmilk substitutes and the conditions of workers in Adidas factories came under the scrutiny of Members of the European Parliament (MEPs) at a Public Hearing on 22nd November 2000, examining the effectiveness of international standards and codes of conduct. Organised by the Development and Cooperation Committee, the Hearing focused on marketing in Pakistan and why, nearly 20 years after the International Code was introduced, baby food companies continue to be accused of irresponsible marketing practices. The Network for Consumer Protection in Pakistan explained how it had registered complaints about labelling with the European Commission using export regulations (which Baby Milk Action and IBFAN partners had helped to bring in). The Network also presented its reports Feeding Fiasco and Milking Profits. These reports contain documentary evidence of company marketing methods provided by Network's monitoring and evidence from Syed Aamar Raza, a former Nestlé employee. These included bribing of doctors, setting of sales targets and performance bonuses for marketing staff and direct marketing to mothers. (Reports can be purchased from the Virtual Shop). "...two principles, universality and the scope, including all breastmilk substitutes, cannot be over-emphasised given the tendency of the infant feeding industry to attempt to limit the application of the Code." During questions, it was noted that Nestlé's "Charter" setting out its policy, in contrast to the Code, was limited to developing countries and to infant formula. (Click here for further details and the text of UNICEF and IBFAN's presentations). Nestlé was invited to the Hearing because the company figures prominently in the complaints of marketing malpractice from around the world. At the Nestlé shareholder AGM in 1999 Chairman Helmut Maucher said he welcomed the Hearing, but when the time came the company, with over 230,000 employees, failed to turn up. Varying excuses were relayed to the MEPs who were present. Richard Howitt MEP, who arranged the Hearing, told The Independent newspaper (23rd November) that Nestlé had demonstrated: "utter contempt for a properly constituted public hearing. Not to attend reveals a combination of arrogance and distance which has set their cause back." Baby Milk Action remarked to Nestlé's new Chief Executive, Peter Brabeck about this at the Nestlé AGM in April and asked was he able to address students at the London Business School the following day. Instead of sending a representative Nestlé asked Sunil Sinha of Emerging Market Economics (EME) to give a presentation. Nestlé also proposed that the Labour peer Lord Ahmed be allowed to speak, but this was refused. EME had conducted an audit for Nestlé in Pakistan - which significantly failed to look at Syed Aamir Raza's evidence. EME mentioned Nestlé's incorrect interpretation of the Code and Resolutions (see Update 28). A representative of the European Comission commented on its failure to act on the labelling violations reported to it by The Network. Richard Howitt MEP called for a review of the procedures to clarify which organisations are the "competent authorities" to register complaints and why, when complaints had been submitted, they are not acted upon. (see also Update 29). "Adidas, Nestle, and other UN officials were also invited, but due to scheduling conflicts, sent their regrets." "After numerous attempts to 'influence' the programme, both companies chose to boycott the hearings." A group of Bristol residents, angry at Nestlé's continued involvement with @Bristol, decided to use a bit of positive advertising by distributing a whole series of posters around Bristol aimed at informing people of Nestlé's record of marketing malpractice, and of how @Bristol has become Nestlé's buffer-zone to absorb criticism. The posters denounced the hypocrisy of a company whose marketing practice is contributing to the deaths of millions of babies around the world, while being involved in an educational project aimed at children. @Bristol recently held an open evening for science teachers to see the facilities on offer. Baby Milk Action members, joined by local residents, were also there to offer a different perspective. As teachers arrived for their complimentary glass of wine they were met by protesters who were chatting and handing out leaflets and samples of fair-trade coffee. The response from teachers was very positive and many were aware of the issues and offered to discuss them with the @Bristol staff inside. Despite the awareness-raising efforts of local residents, the Nestlé sponsorship of @Bristol still remains. You can help by writing to @Bristol; Mr. John Durant Chief Executive @Bristol, Anchor Road, Harbourside, Bristol, BS1 5DB, UK. Lichfield District Council has stated that it will not be considering sponsorship from Nestlé for its multi-million pound theatre development. Local people in Lichfield had been voicing their concern over the link between the Council and Nestlé (see press release 18 February 2001). Calls on the Council for an open meeting with presentations by Nestlé and Baby Milk Action were rejected. This was criticised by many Councillors. Instead a working group met with both sides in private and subsequently announced a non-exclusive trade deal with Nestlé. However, in a recent letter to Baby Milk Action, Nestlé confounded this by stating that the deal was sponsorship! Local residents are continuing their call for an open public meeting to debate the issue and are calling on the Council to ensure that fairly traded alternative products and healthy options, such as water fountains, are available on its premises. Save the Children has published a report based on monitoring conducted in Recife in Brazil last year. Violations were found by a number of companies. Nestlé was criticised for, amongst other things, obscuring the "breast is best" message on formula labels with the plastic lid. Nestlé responded as if this was news and agreed to change the labels in Brazil. Yet Baby Milk Action has been campaigning on this issue for some time and has even registered a complaint with the European Commission over Nestlé exports to Tanzania. Why isn't Nestlé ending this labelling tactic everywhere? Nestlé is also understood to be one of the companies named in a Brazilian government monitoring report which was expected to be published last year. Reports in August stated that Niels Christiansen, Nestlé Vice-President, went to Brazil to raise the monitoring report with the Government. The Government denies a suggestion in one newspaper that it had discussed the report with Nestlé. Baby Milk Action accepts this and removed links to this article from its website. After a Baby Milk Action letter-writing campaign Nestlé stated that it would welcome the report when it is published. We look forward to the report, which is long awaited. 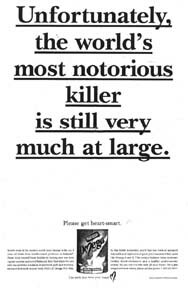 (Also see October/November 2000 Campaign for Ethical Marketing action sheet). Nestlé has now withdrawn this Internet promotion, for a three-month free supply of formula, following Nestlé's AGM when Baby Milk Action brought it to the attention of shareholders. The 'New Mom Makeover' promotion was run by NBC, an American broadcasting company. Before it was removed the company made an attempt to mollify complaints adding the words - "or cash equivalent for breastfeeding Moms" (showing that Nestlé knew this was unethical advertising). This NBC/Nestlé Carnation promotion blatantly breaks the WHO International Code of Marketing of Breastmilk Substitutes, and has now been withdrawn following public outrage. Internet advertising is becoming increasingly prevalent and respects no national boundaries or national laws. Internet advertising is mentioned in the World Health Assembly resolution (WHA 54.2) adopted this May (see Update 29). In an article in The Independent on the 15th of May, Vice President of Nestlé, Neils Christiansen, said about this promotion "We have told Nestlé US not to do that in the future; we don't think that is the appropriate context for our product." But he maintained that other adverts for formula on Nestlé's website are not on the front page and are not available outside the US! There was a heated debate on BBC Radio Birmingham in April over the health implications of Nestlé's marketing practices. Not an unusual occurrence in the media, only this time it was about the health of parrots! Nestlé's new advertising for its chocolate Rolo's, involved Robinson Crusoe giving his last Rolo to his pet parrot. His companion, Friday, subsequently cooks the bird and presents it to Robinson to eat! Angry listeners to Pebble Mill phoned in to say Nestlé should withdraw the advert as parrots digestive systems cannot tolerate chocolate and parrots could die from eating it. Nestlé said the ad was cleared by the ITC and it doubted it would encourage children or adults to feed chocolate to their parrots. Yet another example of Nestlé's indifference to safety issues. Nestlé is widely criticised for using health claims to promote its foods. This ad in the Malaysian New Sunday Times is not, as it first appears, an admission of its record on baby food marketing, but yet another promotion using dodgy health claims to promote its functional foods. On Saturday 19th May, demonstrators held their annual protest outside the Nestlé UK Headquarters. This year the demonstration marked the 20th anniversary of the International Code of Marketing of Breastmilk Substitutes which was introduced in 1981. 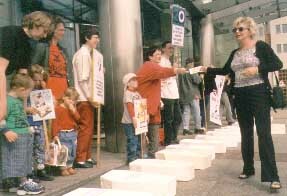 The 20 years of the Code was marked by 20 child-sized coffins placed along the pavement outside the Nestlé building. Each coffin held a plaque bearing a year between 1981 and 2001 and bore the figure of 1.5 million babies who died in that year due to not being breastfed. Leaflets were handed out to passers-by and a small delegation of children took a box full of petitions inside to present them to a Nestlé representative. Click here for more demo pictures.